Bundesliga | Dan-Axel Zagadou: To the left, doing it right, jump up and down if you’re a Borussia Dortmund fan! Dan-Axel Zagadou has answered Borussia Dortmund's defensive call. Dan-Axel Zagadou: To the left, doing it right, jump up and down if you’re a Borussia Dortmund fan! 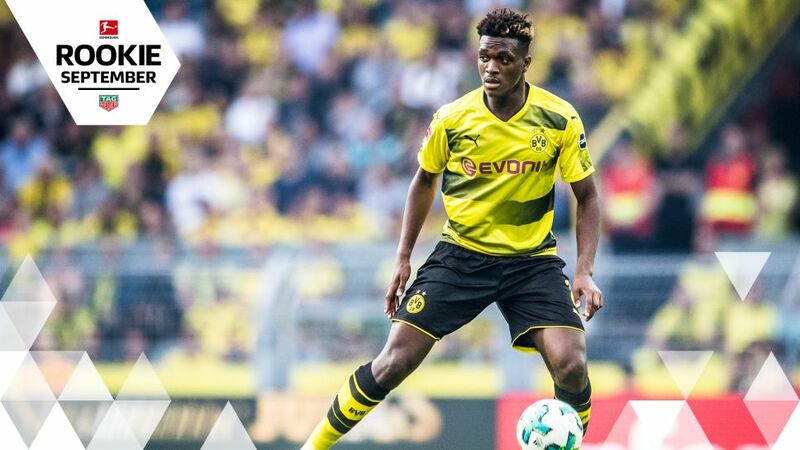 “I chose Borussia Dortmund because this big club has success in integrating young players into its ranks, and at the highest level.” So said French defender Dan-Axel Zagadou following his summer move to Die Schwarzgelben, and the 18-year-old’s wise words are quickly beginning to ring true. An imposing central defender, the 6Ft 4In tall talent was snapped up by BVB from Paris Saint-Germain and has quickly found himself playing a part in the Bundesliga giants’ brilliant start to the current campaign. When regular left back Marcel Schmelzer was sidelined with an ankle injury, coach Peter Bosz turned to Dortmund’s young acquisition from the Paris suburbs to fill a significant void left by the club captain. Displaying impressive versatility, Zagadou has delivered in an unfamiliar position, making six appearances – and four starts – in the Bundesliga’s meanest defence this term. "He's playing out of position but he's doing very well. He's pretty quick despite his size and he's got good technique," new BVB coach Bosz said of the impressive Zagadou. “We are fully convinced of this player’s abilities and look forward to helping him in his development,” the club’s sporting director Michael Zorc added. Only two full-backs have bettered Zagadou’s 59 per cent challenge success rate while the France Under-19 captain has demonstrated a mature willingness to receive possession and a controlled touch while on the ball. Keen to follow the path of former Ligue 1 talents who made a successful transition to Dortmund – stars such as Pierre-Emerick Aubameyang, Raphael Guerreiro and the recently departed Ousmane Dembele – Zagadou is already showing signs he could be set for similar glory in North Rhine-Westphalia. Click here to cast your vote for Zagadou in the September Rookie of the Month vote!